Yes, you can view a famous poster on this red brick wall until April 12. The Berlin Medical Historical Museum (Berliner Medizinhistorisches Museum der Charité) started a new Fritz Kahn exhibiton January 23. Whether you will get there or not, don't worry, you may see now an animated version by Henning Lederer here. How much fun is it? My favorite is the 'minicameraman' clicking away. Had you heard of Fritz Kahn (1888-1968) before? I had not when a friend emailed me a link for the animation. 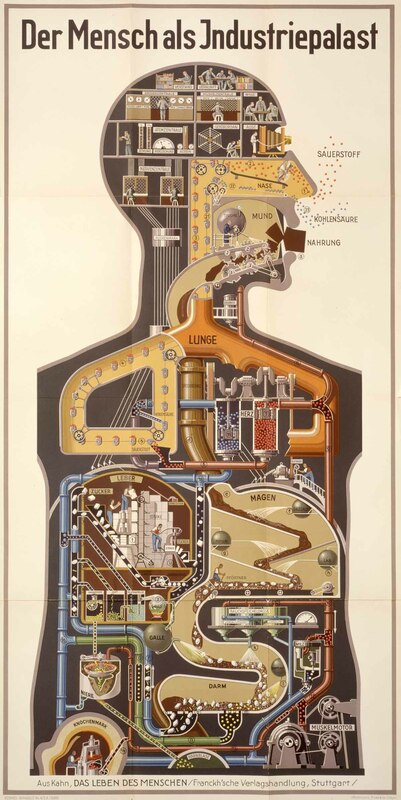 The 1926 original above, Man as Industrial Palace, is not like the stick figures I left behind in elementary school: it is one physician's view of the human anatomy in a confluence of technology and culture. Would you consider it a sci-fi a la Machine Man? I would not, however, Kahn's humor, especially his devising many a 'miniworkman' inside the virtual patient, is enjoyable. Advances in computer technology have let us develop biology codes that serve a design function as in the sample run (above) for a car. Our capabilities continue to expand into higher complexities and scales of space and time. A graph by Albert A. de Graaf and colleagues in Nutritional Systems Biology Modeling: From Molecular Mechanisms to Physiology compares various biology models with space-time ranges. Seven types are described accordingly. Both multilevel models and experimental data that bridge the space-time ranges are needed now and in the future. Agreed! On another angle, I chose this article because nutrition modeling is critical for accurate human thermoregulation models, e.g. JOS (above). The Entelos model aims to reproduce clinical observations in humans while relying on descriptions of processes from the cellular to the organism level; only the key biological processes (and molecular agents) are selected to serve a particular clinical objective. A recent patent, Apparatus and Methods for Assessing Metabolic Substrate Utilization, extends Entelos® Metabolism PhysioLab® platform to "improved diagnosis, clinical testing, and personalized treatment across a highly variable patient population." The newly patented method will allegedly allow examination of differences in fuel utilization (fat, carbohydrate, and protein metabolism) towards more effective therapies. On a similar note, De Graaf and colleagues give an example of a future multiscale model to study insulin resistance. This hypothetical model, which they call "tissue-specific pathway model" in relation to three existing models, would enable "the incorporation of tissue-specific gene expression data, which form an important data source from the nutritional wet lab." Variability in humans will continue to be challenging even though the virtual patient concept is here to stay. Starting from a nutritional study all the way up to human presence anywhere, a multitude of variations arises in experimental observations. A model's adequacy is not within our easy reach. Modelers know two paths, probabilistic and deterministic. The former path is discussed here in relation with Matt, the surfer. The latter path, simply said, describes the patient, individually or groupwise, in detail to allow multiple parametrizations followed by multiple simulation runs with results to match the experimental data. However, model accuracy is not an easy achievement. So far, I have reviewed in brief what I consider popular, commercial, and academic trends in man-machine modeling. Before bringing up another article, Bayesian Integration and Non-Linear Feedback Control in a Full-Body Motor Task, by Ian H. Stevenson et al., let's watch Matt surfing at Koel Bay, South Africa. Image Credit: Daniel Flower (http://www.flickr.com/photos/danielflower/377500529/), adapted by Ian Stevenson. In a nutshell, a full-body, goal-directed task, similar to surfing or snowboarding, where we steer a cursor with our center of pressure was studied by the authors. In their view, human "subjects respond to sensory uncertainty near-optimally in this task, but their behavior is highly non-linear." Our nervous system seems to compute to a 'sophisticated' set of costs and constraints of the task while appearing to implement Bayes-like mechanisms for a full-body, dynamic task. The experimental setup and approach, and some measurements are given in the article along with some results. 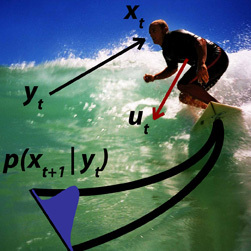 What is sampled is a particular behavior as inspired by Matt's surfing but observed with us when we move to reach "in a small workspace or standing on a force plate passively viewing a stimulus." To repeat, in a task similar to surfing, human response to sensory uncertainty is near-optimal and highly nonlinear. This is about real humans, folks. Real-time virtual humans are next! Tables such as the one prepared by Badler et al. are useful to evaluate the state of the art on the way to 2020 and beyond. Some people see a merger of man and machine sooner than 2050 -- but never by 2020. They see machine autonomy and intelligence threatening our world. What was Kahn thinking when he paid professional artists to illustrate 2,000 images? Could he have even imagined an animation of his poster, Man as Industrial Palace, eight decades later? It is kind of fun to see the animation box hanging on a wall with wires attached. But this Machine Man is even funnier.